Bald Vinny outside of his t-shirt stand on River Ave. I got to the stadium around 3 PM. Unlike yesterday, the skies were blue with nary a rain cloud to be seen. I met up with famed Bleacher Creature Bald Vinny (pictured right) at his T-shirt stand on River Ave. He sells these custom t-shirts before every home game at Yankee Stadium. You can check out his website at Bald Vinny's House of Tees. I interviewed Vinny for the podcast. You can hear my talk with Vinny in the podcast section of the website or by subscribing through iTunes. Vinny invited me to sit with the creatures in section 203 of Yankee Stadium. I was able to participate in the legendary Yankee Roll Call, which you can also hear in full on the podcast. For those of you unfamiliar with the Roll Call; the Creatures chant each Yankee position player's name (except the catcher) at the start of the game. As the chants grow each Yankee player waves to the bleachers acknowledging the fans. This may not be the House that Ruth built anymore, but those in the stands continue the Yankee legacy. Before the game started I entered at Gate 8 and went directly to the monuments. 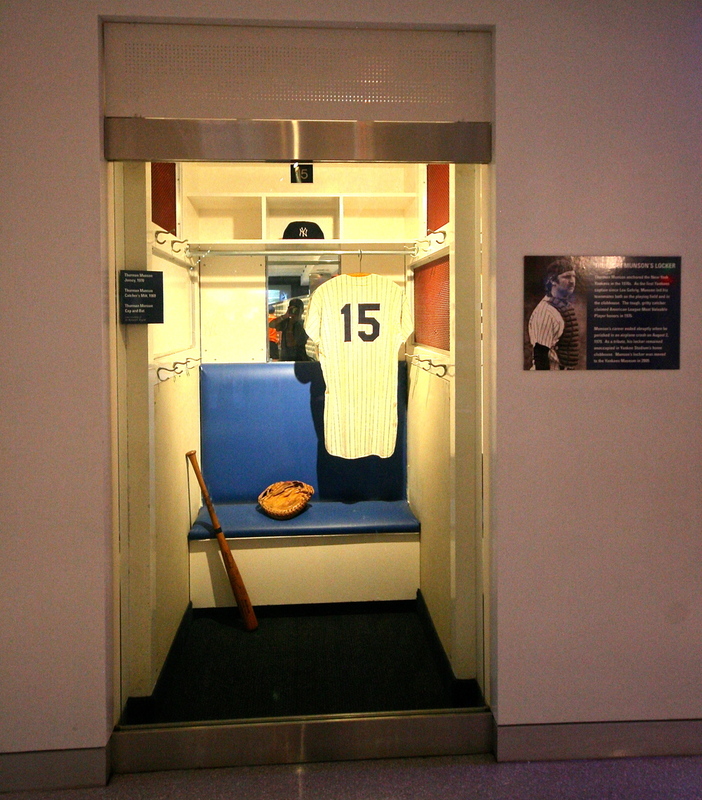 When I was a kid I used to think that the Yankee greats were buried in Monument Park. I was always scared for the outfielders who had to run towards them in the old Yankee Stadium. Although Derek Jeter and I are from the same town (Kalamazoo), I have never been able to cheer for the Yankees. As I stood in front of monuments to Ruth, Gherig, Dimaggio, Mantle and many, many more I could not contain the reverence I felt for what this franchise has meant to the game of baseball. Every story needs a villain and there is no enemy greater than the Evil Empire. As first pitch time approached, I wandered over to the Lobel's truck. I mean no disrespect towards Citi Field, but thus far my best meal was a prime beef steak sandwich from the New York butcher shop that is five generations old. It looks simple, but the meat melts in your mouth. The game was still 30 minutes away so I took this time to check out the Yankee museum. Sitting amongst the multitude of World Series trophies is an amazing exhibit recreating the final pitch of Don Larsen's perfect game from the 1956 World Series. The trajectory of that magical pitch is recreated with a case of signed balls filling the 60 feet 6 inches between Larsen and Yogi's mitt. The game started off with a bang. The Mets lit up David Phelps with five runs in the first. The air was taken out of Yankee Stadium before half the seats had been filled. With the Bronx Bombers on the ropes, the Mets fans in attendance began to out shout the home team's fan base. The game turned into a lopsided victory for the Mets as they were on their way to a four-game sweep of the Yanks. In the quiet moments of the game I able to talk to Sean Boardman and his son Zach. Sean has quite the luck when it comes to winning tickets as he discussed with me for the podcast. While I had a great time, in an effort to be as honest with you as possible, I was a little underwhelmed with the new Yankee Stadium. Perhaps it was the rough first inning, or maybe the ticket prices have driven away a fan base so used to winning. I have been to the old stadium several times and the energy that existed there has yet to arrive across the street. Perhaps over time a new legacy will grow, but for now the ghosts of Yankees past no longer haunt these hallowed grounds, everything is still too shiny and new.